Holden car dealers in New South Wales, Queensland and Western Australia are among the first in Australia to take delivery of the all new Volt long range electric car this week. Nine specialist dealers in NSW, nine in QLD and seven in WA will add a Volt to their demonstration fleets and can begin delivering cars to their first customers in coming days. Holden Executive Director – Sales and Marketing, Philip Brook said there had been strong interest in Volt since dealers were announced in June and television advertising had begun. 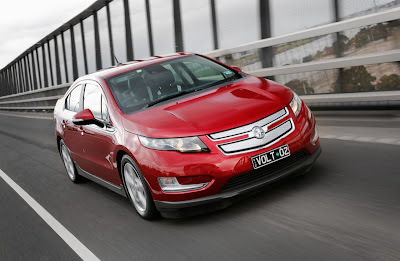 “Volt really seems to have captured people’s imagination thanks to its range extension technology. As the first car of its kind to go on sale in Australia, drivers want to understand how the technology works and what it feels like to drive and live with an electric car. As part of the commitment to become a specialist dealer, each Holden Volt dealer has invested in training and equipment and has committed to achieving environmental accreditation. They have also installed a dedicated Volt charging station in both the sales and service areas.